Throughout the year, Mount Baker Theatre (MBT) works hard to make sure that there is a little something for everyone. From ballet, music legends and children’s theater to silent film, tribute acts and touring Broadway shows, there’s always something fun going on. That’s why Evil Dead: The Musical will splatter the Main Stage for just one night on October 7, appropriately sponsored by local clean up experts Bay City Supply. 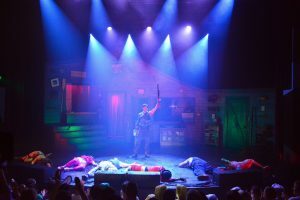 Evil Dead: The Musical is based on elements of the cult-classic horror films Evil Dead, Evil Dead 2 and Army of Darkness. Photo courtesy: Mount Baker Theatre. 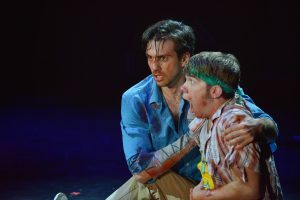 If you haven’t heard of Evil Dead: The Musical, it’s a show you’ll never forget. This macabre musical comedy sensation is based on elements of the cult-classic horror films Evil Dead, Evil Dead 2 and Army of Darkness. It combines them to make one of the zaniest theatrical experiences of all time. Of course, the production isn’t for the faint of heart. The show uses strobe lighting, gunshot effects, smoke, blood, axes, chainsaws, blood, severed body parts and even more blood. 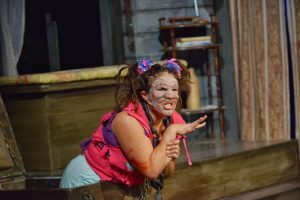 This production promises laughs, thrills and a lot of gore-splashing fun. Photo courtesy: Mount Baker Theatre. How on earth did a trio of horror films become a hit musical? The first of the Evil Dead films written and directed by Sam Raimi and starring cult icon, Bruce Campbell, appeared in 1981. These movies used comedy, gore, slapstick, blood, one-liners and creative camera techniques to revolutionize the horror genre. Together the trio of films grew a cult following that has helped define and deeply influence modern horror. In 2003 a group of young people in Toronto first adapted the story to musical form in the back room of a small bar called the Tranzac Club. Like the films, the musical quickly became a cult classic as well. Other cities began requesting performances of the musical and in 2004, the show opened in Montreal as a featured attraction at the Just for Laughs Comedy Festival. Evil Dead: The Musical is a show you’ll never forget. Photo courtesy: Mount Baker Theatre. By November 2006, Evil Dead: The Musical made its Off-Broadway debut in New York City and the cast album from the show debuted at #4 on the Billboard Show Charts. 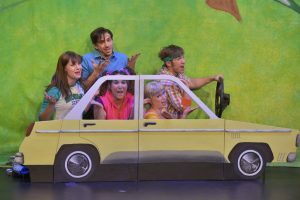 In 2007, the production returned to its roots, opening at Toronto’s Diesel Playhouse where it became the longest-running Canadian show in Toronto in over two decades. It also began winning awards including the Dora Audience Choice Award as Toronto’s Favorite Show. It was then produced in Seoul, Tokyo, Las Vegas and over 350 other locations. Everywhere theater fans wanted some blood with their musicals, there was a production. The production that will splatter MBT’s Main Stage in October is a recent staging produced by Starvox Entertainment in association with original producer Jeffrey Latimer, based on collaboration with the show’s original Toronto and off-Broadway creative team. Get your tickets now for Evil Dead: The Musical. Photo courtesy: Mount Baker Theatre. The current staging promises to be a huge scale campy gore-fest complete with the coveted up-close and seriously-personal seats in the “Splatter Zone.” Those seated in this zone will be splashed by stage “blood” and get increasingly wet over the course of the performance. Heads will roll, arms and limbs will fly and the blood will gush to the audience’s delight. During the original Toronto and off-Broadway runs, in a style reminiscent of Rocky Horror Picture Show, the so-called “Dead-ites” would line up for hours for the privilege of getting drenched with gore from all the onstage mayhem. MBT will carry on the tradition. Those seated in “The Splatter Zone” are encouraged to wear white so that when the curtain falls at the end of the performance you can proudly show off your blood-stained self to the disbelieving looks of the rest of the less-brave audience! Theatergoers in the zone can wear ponchos available for sale at the merchandise table but most go au naturale. Critics love this “demented delight,” calling it “Bloody hilarious!” and “Freakin’ awesome!” NYTheatre.com said, “If you think Sweeney Todd is for sissies; you need to see Evil Dead-The Musical!” It also won both the equivalent of the Korean and the Canadian Tony among other accolades. Audiences need not be a fan of the Evil Dead franchise or musicals to love the show. You’re guaranteed a unique night of fun that you’ll talk about for years to come. Tickets for this raucous splash-fest go on sale Friday, June 9 at 10 a.m. until they’re gone. Fans of Bellingham’s own horror film festival and horror convention, Bleedingham and die-hard video store Film is Truth will snap up tickets early so get yours before they sell out.